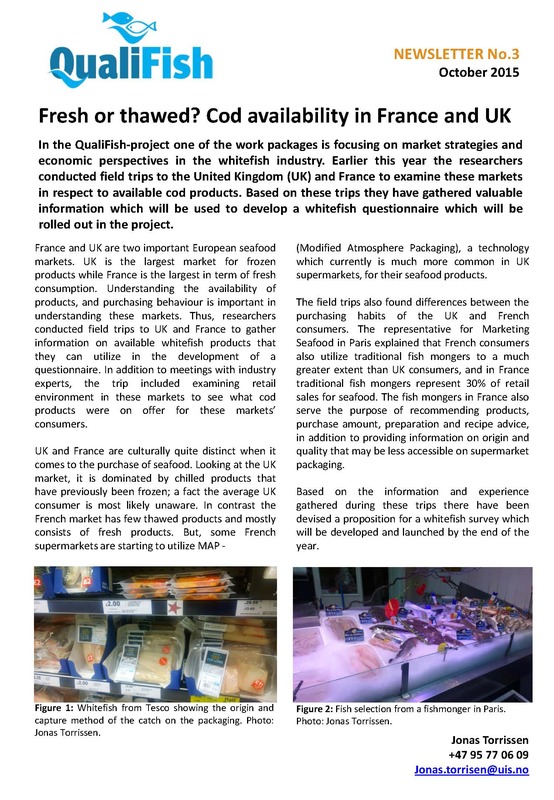 Earlier this year a researcher in the work package focusing on market strategies and economic perspectives in the whitefish industry conducted field trips to the United Kingdom (UK) and France to examine these markets in respect to available cod products. Based on these trips they have gathered valuable information which will be used to develop a whitefish questionnaire which will be rolled out in the project. Read more about what they found out in our latest newsletter! 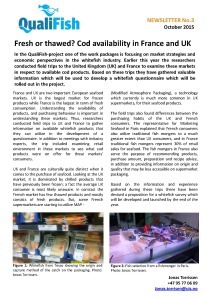 A doctoral student in the QualiFish work package regarding market strategies and economic perspectives has conducted a field trip to London and Paris to examine the availability of cod products and substitutes to its consumers. His findings will give input to a whitefish survey that will be rolled out this autumn. 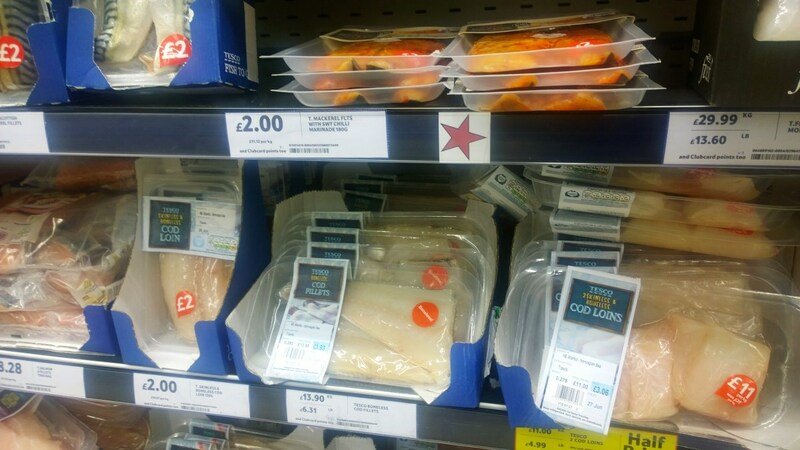 He discovered that while chilled fish in London supermarkets are pre-dominantly thawed, chilled fish in Paris is not thawed. However, the London consumer is generally not aware of that the chilled fish is thawed. Also, the Parisians shop to a much greater extent with traditional fishmongers. A distribution channel that makes up 30% of the sales when one excludes Hotel Restaurant & Catering (HoReCa) in France. In London however retail is the distribution channel to consumers besides HoReCa. In June we got the opportunity to present the #QualiFish project to the Norwegian Ministry of Trade, Industry and Fisheries (NFD, Nærings og Fiskeridepartementet) employees during a breakfast seminar at the ministry. 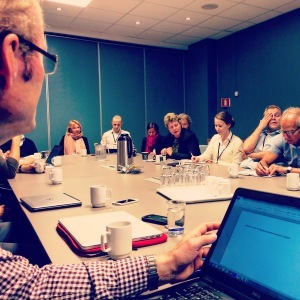 The meeting was initiated by the Norwegian research council to showcase how the BIONÆR Research Programme contributes in relation to solving the challenges the Norwegian fisheries is facing. QualiFish was one of three projects that were presented. This year’s activities are well on their way in the QualiFish-project. 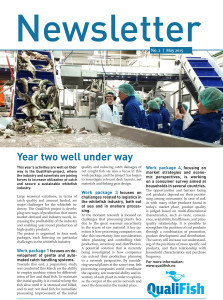 Read more about previous and ongoing work in the project and its work packages in our latest newsletter! This year april 17th was no ordinary Friday in Kabelvåg Ils sportshouse – «Idrettshuset». 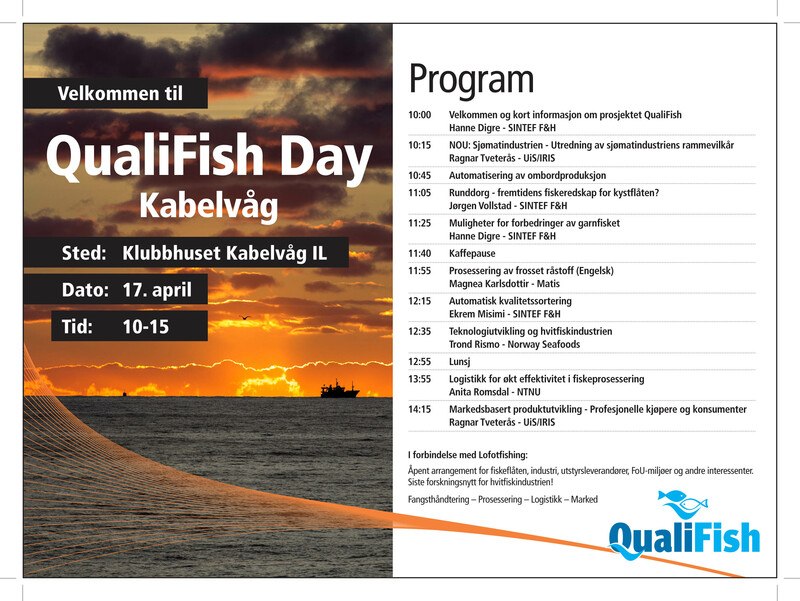 It was the launching of QualiFish Day 2015, arranged in association with LofotFishing, with in total eight presentations on subjects ranging from fishing tools and quality to logistic challenges in the white fish industry. The day was a great success both for project partners and others in the audience. You could tell by observing a very excited audience. Clear your agenda for April 17th. Let nothing keep you from QualiFish Day, this year arranged in association with Lofotfishing. 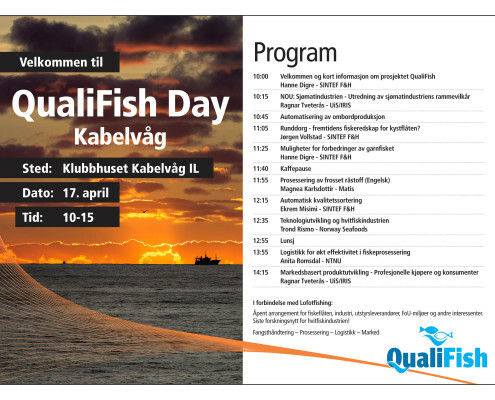 This is an open event where the fishing fleet and industry, equipment suppliers, R & D environments and other stakeholders are welcome to learn the latest news on research results from the Qualifish project. An array of subjects within various thematics targeting whitefish industry, eg. catch handling, processing, logistics and marketing, will be covered. 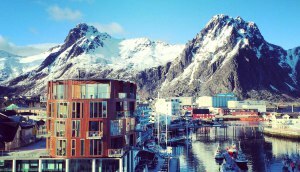 The event takes place in Idrettshuset (Sports Hall) of Kabelvåg IL, next door to Lofoten Fishing exhibition area. http://qualifish.no/wp-content/uploads/2014/03/QualiFish_logo_icon.png 0 0 QualiFish http://qualifish.no/wp-content/uploads/2014/03/QualiFish_logo_icon.png QualiFish2015-03-03 09:28:002016-08-01 09:00:21QualiFish goes Lofotfishing! GUIDED TOUR: Irja Sunde Roiha from NIFES visited MS «Grotle» together with SINTEF-employees. Runar Grotle from Havstjerna AS provided all the details about the new vessel. Nor-Fishing 2014 has come to an end, and the QualiFish-team can look back at four eventful days in Trondheim. Project manager Hanne Digre started off on Tuesday with a mini-seminar at the Norwegian Research Council stand. Her presentation titled “Technology development from catch to processing for market adapted production of cod in Norway” was well received among the audience. On Thursday a productive meeting between vessels, processing industry, equipment suppliers and fishery organizations in the industry arena was conducted, discussing possible future contributions to the project. 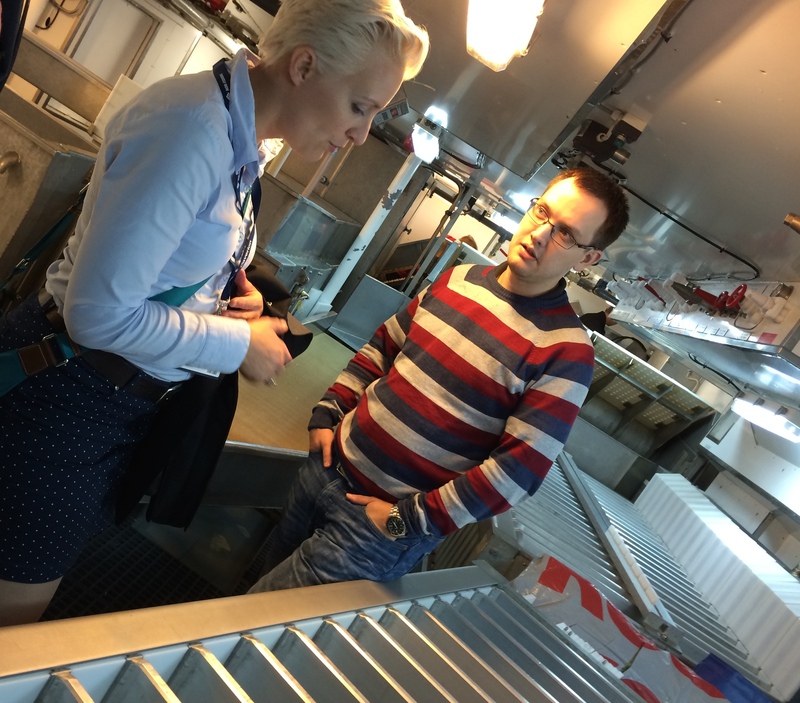 Additionally, employees from SINTEF and NIFES (The National Institute of Nutrition and Seafood Research) got the opportunity to visit the brand new fishing vessel MS “Grotle” (picture), one of the industry partners in the project. On the last day of Nor-Fishing the research partners gathered to make further plans related to case studies and research activities. – The exhibition created the backdrop for several good meetings and discussions in the project, says project manager Hanne Digre. 14 547 visitors from 48 countries visited Nor-Fishing 2014 to see 450 exhibitors from 23 countries. Nor-Fishing is an important meeting place for the fisheries industry, attracting15-20.000 visitors from over 50 nations. News from research and development is an important part of the exhibition. 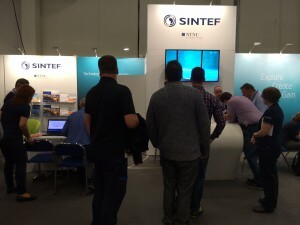 QualiFish is represented at stand D-320, SINTEF Fisheries and Aquaculture. The QualiFish attendance includes a presentation of the project at the Research Council of Norway at stand D 332-333, and a project meeting with the work package leaders involved in QualiFish. On day two of the three day event, QualiFish organized a successful meeting between vessels, processing industry, equipment suppliers and fishery organisations. 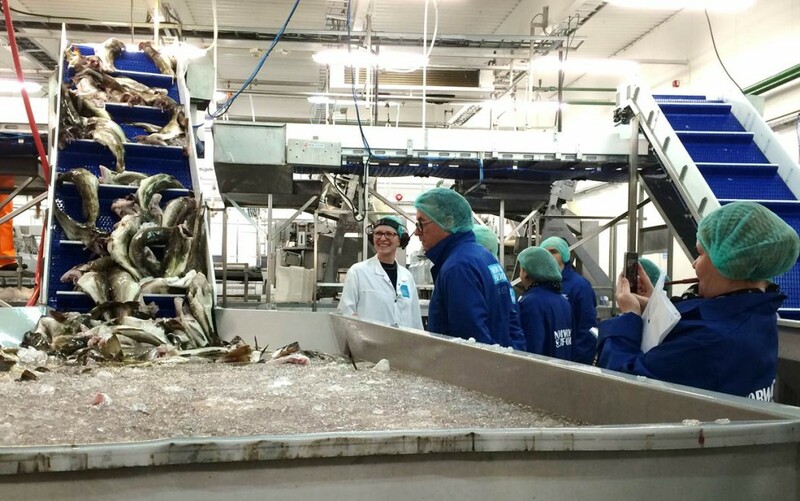 The Research Council of Norway is encouraging the cooperation between scientific research and the industry, fostering new and better products in the white fish industry. The BIONÆR programme promotes research and innovation that enhances value creation in Norway’s bio-based industries, and supports the QualiFish-project. Read the Research Council of Norway’s article “Bedre og ferskere torsk – hele året!”.